Pair perfectly with falafels in a wrap, through pasta or enjoy with crackers and veggie sticks. 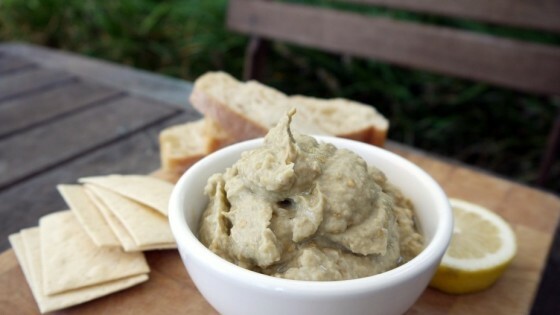 This dip freezes well and is very versatile for an easy entertaining idea. 1. Preheat a fan forced oven to 160C. 2. In a bowl, toss the eggplants in the oil and salt. Place them cut side down on a large baking tray. It is okay if they are touching. Bake for 40 minutes. Allow to cool for 20 minutes. 3. At the same time, wrap up the head of garlic in aluminium foil and place onto the racks in the oven. Cook for 30 minutes. 4. Using a spoon, scoop the eggplant flesh out of the eggplant and into a bowl. Do the same with half of the garlic. You should be able to squeeze the base of each clove and the creamy garlic will burst from the top. 5. Add the tahini, lemon juice, paprika and pepper. Place all ingredients into a food processor and pulse until it is soon and consistent. 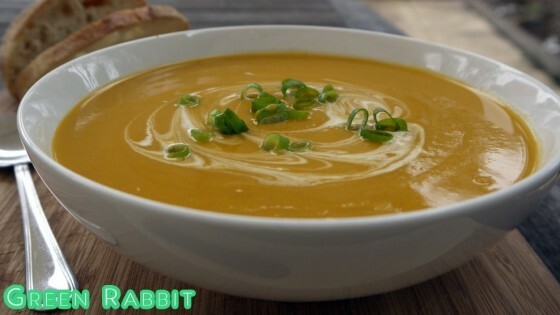 If it isn’t coming together, add a teaspoon of boiling water at a time until it becomes smooth and creamy. 1. Using a 2 litre saucepan, heat the oil over a medium heat and then add the onion, garlic and ginger and saute for 5 minutes or until golden. Add the spices and lime leaf and stir through, constantly for 2 minutes. 2. Add the lentils, coconut and stock and allow to simmer over low, stirring every 3 minutes, until all of the liquid has been absorbed and the lentils are cooked. Approximately 20 minutes. 3. Stir through the coconut milk and serve into bowls. 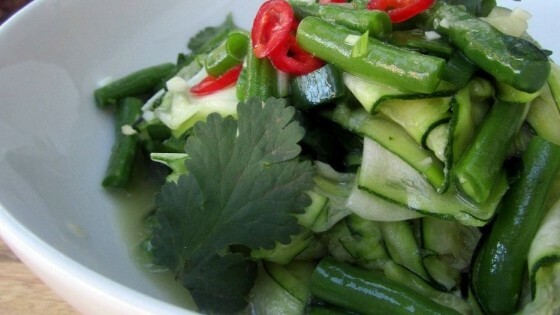 Top with coriander and lime juice. 1. Line a baking tray with canola oil spray and baking paper and set aside. 2. Place the chocolate into a heat proof bowl and into the microwave for 1 minute. Stir and place back into the microwave for a further 30 seconds and stir again. Repeat at 30 second intervals if chocolate isn’t melted. 3. Pour the chocolate onto the prepared tray and spread out evenly using a pallet knife. 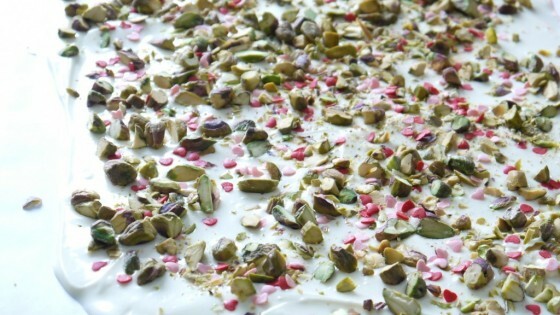 Sprinkle with pistachios and sprinkles and allow to set, approximately 30 minutes. 4. Break into pieces and place into cellophane bags or air tight containers. These cookies are the perfect treat for yourself or when you have unexpected guests. Keep them in an air tight container and you can enjoy them for up to two weeks – if they last! 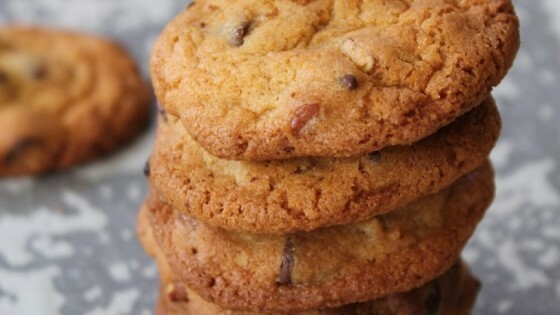 Make extra dough and keep in the refrigerator for instant cookies for up to 2 months. 1. Preheat a fan forced oven to 160C and line a two baking trays with canola oil spray and baking paper. 2. In a bowl, combine flaxseed meal and water and allow to stand for 5 minutes. 3. Using an electric mixer, cream the nuttelex, sugars and maple syrup for 60 seconds on a medium speed. 4. Add the flaxseed and whisk for a further 30 seconds on a medium speed. 5. Add the flour, baking powder, chocolate and pecans and stir until combined. Measure out 2 teaspoon sized balls and sprinkle with a small pinch of smoked sea salt. Place onto the baking tray, 6cm apart and then into the oven to bake for approximately 10 minutes or until golden brown. 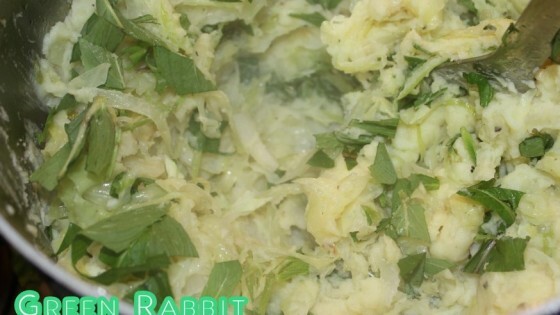 Colcannon is the ultimate budget comfort food and part of my Irish heritage. Grab yourself a large white cabbage and leave a wedge to make some apple coleslaw. 1. Place the potatoes into a large pot and cover with cold water. Simmer over a medium heat until just cooked through. Drain, place back into the pot and set aside. 2. In a frypan, heat the nuttelex and saute the onion and garlic until golden brown. Place into the pot with the potatoes along with the coconut cream, mayonnaise, salt, mint and spring onions and mash using a potato masher. 1. Slice the zucchini lengthways using a very thin slicing blade on a food processor or a madolin. 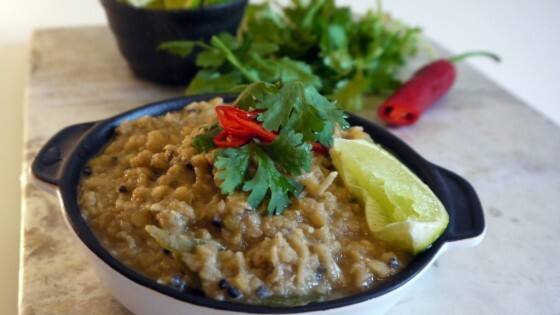 Toss together with the green beans, shallots, chilli and coriander. 2. To make the dressing, place all ingredients into a jar with a sealed lid and shake until the sugar has dissolved. Pour over the salad and serve immediately. 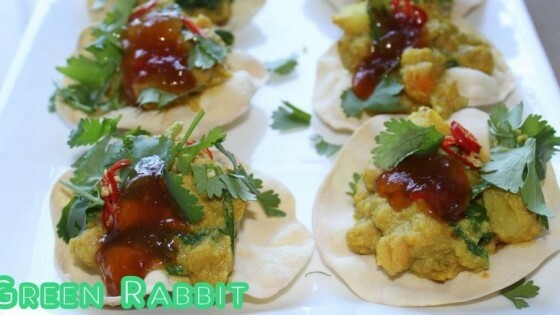 This curry is a great idea for a dinner a dinner party canapé. Pappadums take the place of rice in this dish and make it much easier to eat. The varied textures make for a well balanced Indian dish! 1. Using a heavy based saucepan, heat the oil over a low heat and add the mustard seeds. Allow to pop away for approximately 1 minute. 2. To make the curry paste, place all ingredients into a food processor or mini chopper and blend until smooth and consistent. Scoop curry paste out into the saucepan and stir for approximately 5 minutes using a wooden spoon so that the paste doesn’t catch on the base of the pot. 3. Add the chickpeas, sweet potato, potato, coconut milk, stock, chilli and salt and allow to simmer over a low heat for 30 minutes. Set aside to cool for 10 minutes. 4. Prepare pappadums according to suppliers instructions. 5. Add a tablespoon of curry to each pappadum and top with 1 teaspoon of mango chutney and a sprinkle of coriander. 1. Using a 4 litre soup pot, heat the oil and saute the garlic, onion and ginger until golden brown. Add the cumin, pumpkin, potato and salt and stir to combine. 2. Pour over the stock and coconut and stir until everything is completely submerged. Simmer over a medium heat for approximately 30 minutes, stirring occasionally. 3. Blend with a stick mixer until consistently smooth. With Winter approaching on us fast, it’s important to have a few easy meals ready to go when you get home. 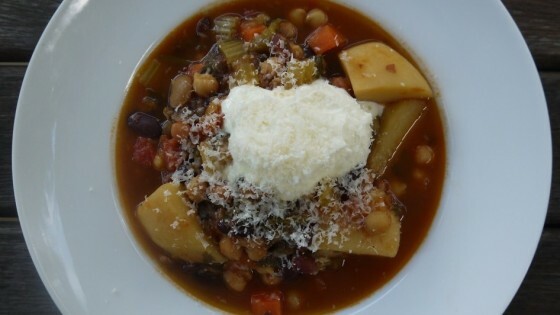 This recipe can be cooked in your slow cooker while you are at work, or as a speedy version on the stove. Enjoy with crunchy bread and make sure you keep a few portions to freeze for the next week! 1. In a 5 litre soup pot heat the oil and saute the onion and garlic until golden brown. Stir tomato paste and saute for a further 2 minutes, stirring regularly. 2. Add the carrots, celery and potato and stir well to coat with tomato. Stir through the canned tomatoes and then rinse the can out with the 420ml boiling water and pour into the pot. In a 500ml heatproof jug, dissolve the stock cubes in 500ml of boiling water and pour into the pot. 3. Add the beans, parsley, salt and pepper and stir well to combine. Cook over a low heat, stirring regularly, for approximately 4 hours. Line a baking tray with canola oil spray and baking paper and set aside. Using an electric mixer with the leaf beater attached, cream the nuttelex, vanilla and sugar until whipped and lightened in colour. Fold through the coconut cream, flour, almond milk and chocolate chips and place into the refrigerator for 5 minutes to firm up. Roll 1 tbsp sized balls and place onto the prepared tray. Place back into the refrigerator to set for 10 minutes. 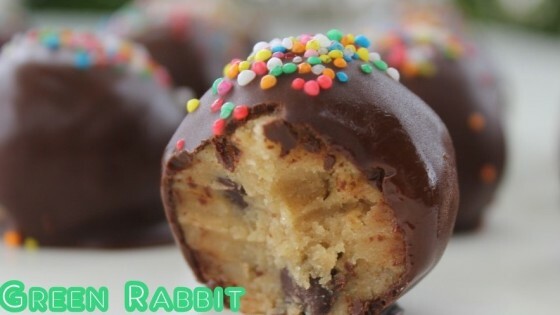 Dip the balls into the melted chocolate and drip excess chocolate off using a fork. Place back onto the baking tray and sprinkle with 100’s and 1000’s. Repeat until all are coated and place back into the refrigerator until set.